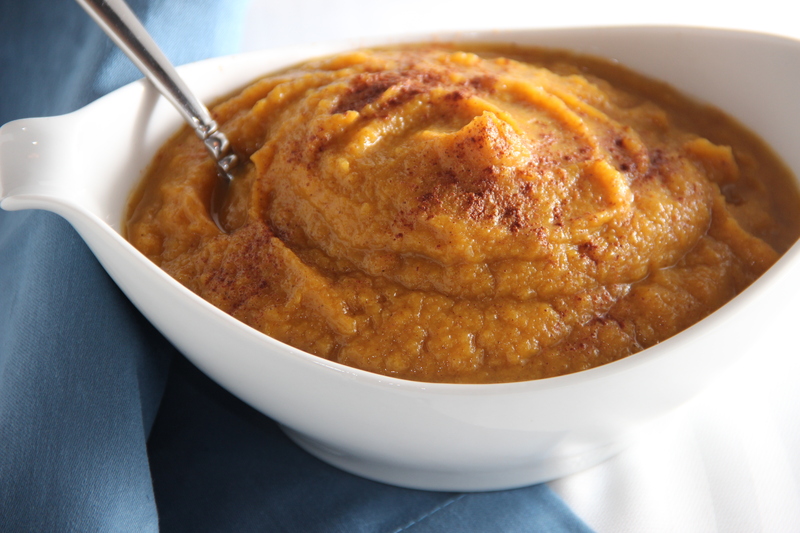 There is a local restaurant in my town that serves delicious steak and seafood entrees along with a ‘seasonal vegetable.’ This ‘seasonal vegetable’ is always Cinnamon Squash (made with mashed butternut squash and, I would guess, cream, butter, sugar, and cinnamon). When I went in mid-July, I thought surely they would have switched it out for zucchini or even summer squash. Nope. 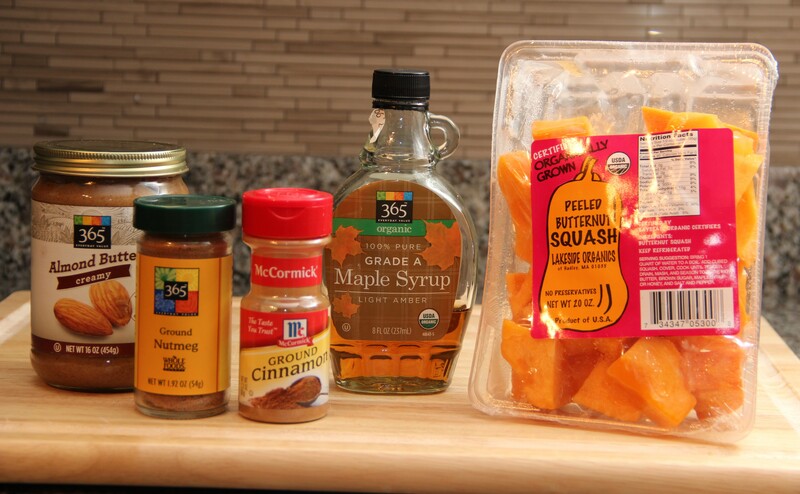 Cinnamon Squash. But I was actually very happy because this cinnamon squash is really velvety, sweet, and so delicious. I must have tried to recreate a healthy version of it at home about 5 times before I finally got it right with this recipe. The key to its rich, silky flavor is the almond butter. 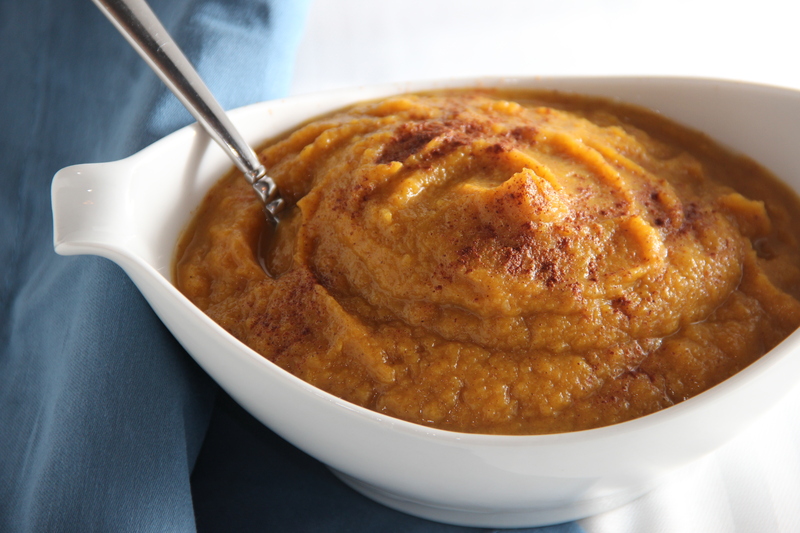 The hint of almond creaminess is the perfect compliment to the sweet squash and the cinnamon. Here are all the ingredients. 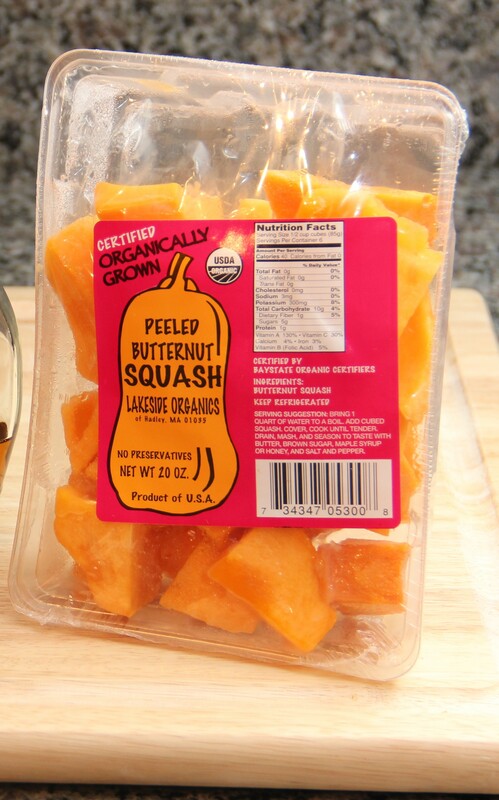 Butternut squash is full of vitamins and nutrients so it’s always a great choice for a healthy side dish. It’s an excellent source of vitamin C, vitamin A, and vitamin E as well as potassium, beta-carotene, and fiber. I don’t recommend tackling a whole butternut squash after a long day at work when you’re starving though. Just save yourself a whole lot of frustration and buy the pre-cut and peeled squash. 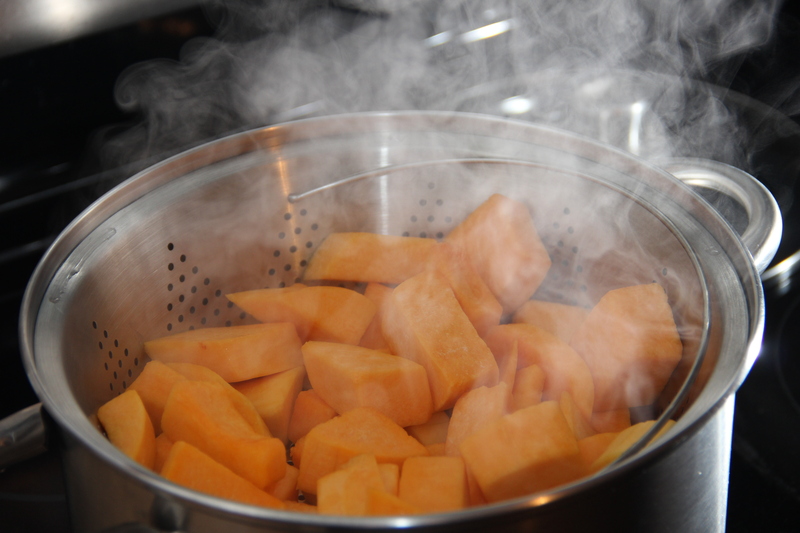 Begin by tossing the peeled and diced squash into a steamer basket over a pot of boiling water. The squash should only take about 12 minutes or so to cook this way. Fast and easy! When the squash is ready (you know it’s ready when you can pierce through it with a fork), scoop it into a large bowl. 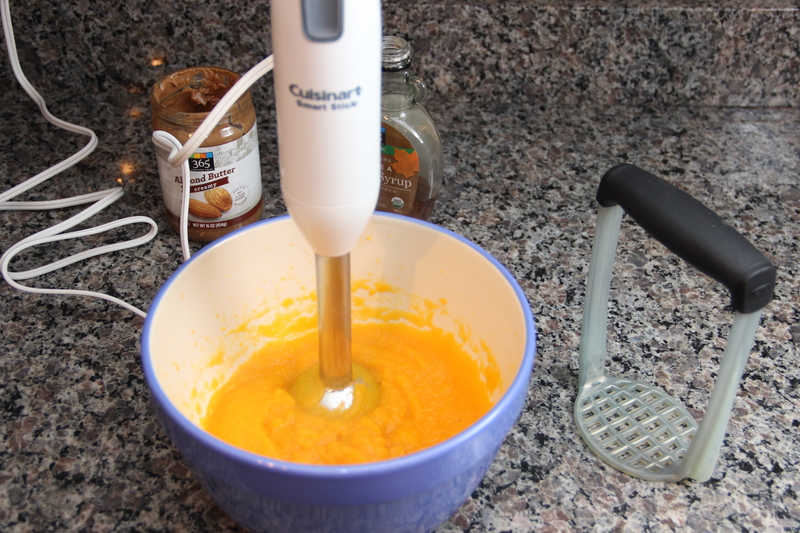 Puree the squash with an emersion hand blender. If you don’t have a hand blender (or you prefer a chunkier texture) you can just use a potato masher. Next, add the cinnamon, nutmeg, maple syrup, and just a pinch of salt. Then add the almond butter. I love using almond butter as a healthy substitute for butter in this recipe. 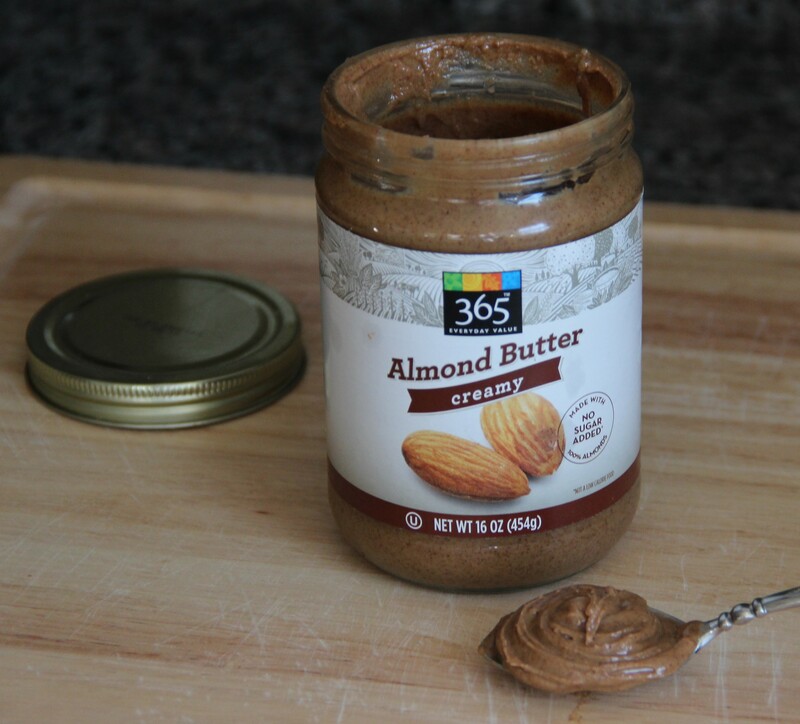 It adds the same creamy richness, but without the saturated fat (1 tablespoons of almond butter has only .5 g of saturated fat as compared to 14 g of saturated fat (!) in 2 tablespoons of butter) And, equally important, it tastes just delicious in this recipe. Now stir it all together until well-combined. And you’re already done. This recipe is super quick and easy. Bring a large pot of water to a boil over high heat. Place the squash in the pot in a steamer basket, reduce the heat to medium, and cover. 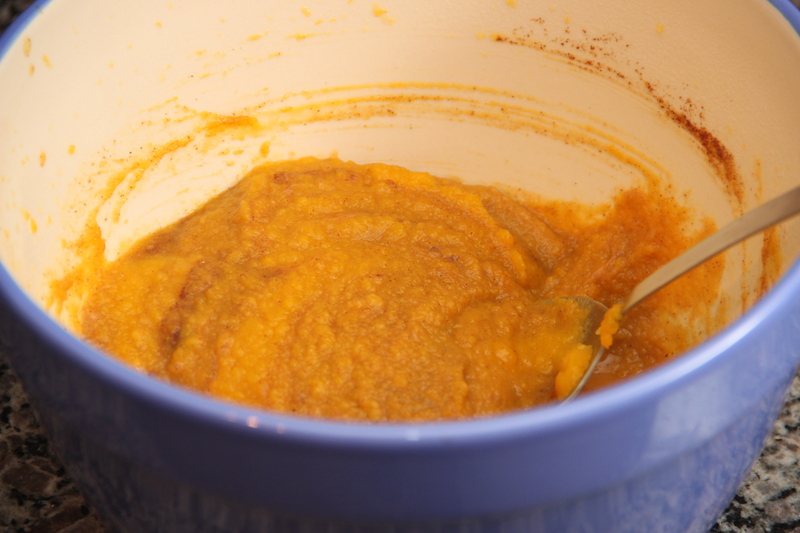 Steam the squash until fork tender, about 12 minutes.Transfer the squash to a mixing bowl and puree using a handheld emulsion blender or a potato masher. Add the almond butter, cinnamon, nutmeg, and maple syrup. Season with salt if desired and serve. I want to “like” all your recipes! Guess I’ll just follow the blog! 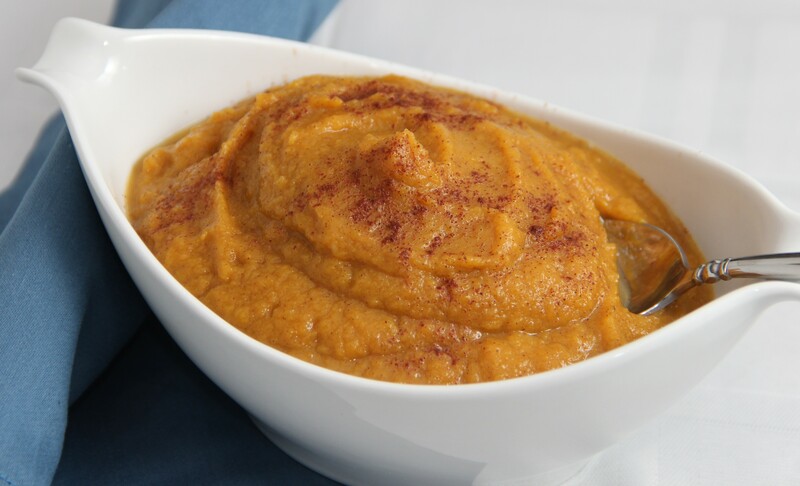 I was just dreaming about a butternut squash/almond butter combo and I’m so glad to have found a recipe that looks so delicious! Thanks Scrumptious Pumpkin. Oooo this looks so incredibly satisfying. Come fall this will definitely be making an appearance on my menu rotation. Your pictures are lovely!